Chandigarh, 9th February 2017: It was the home team’s goalkeeper Tristan Clemons who was rock solid at the post to defend a narrow 1-0 lead that ensured Jaypee Punjab Warriors beat Ranchi Rays in their maiden home game in the fifth edition of the Coal India Hockey India League here on Thursday. The defending Champions taking on two-time title winners Ranchi Rays meant that this was going to be a high-voltage game that would feature great skill and speed. The teams lived up to the expectations as they raced out of the blocks at a frenetic pace, attacking each other from hooter to hooter. Both teams were evenly poised in the first quarter, however, with just two minutes to go for the first break, Manpreet Singh came close to giving the Ranchi Rays a 2-0 lead when he picked up the pass rather perfectly from Gurbaj Singh, tackled into the circle beating two defenders but his powerful strike unfortunately rebounded off the cross-bar. Though Rachi Rays continued to put pressure on the home team into the second quarter too by earning the first PC of the match. It was Baljit Singh who found the foot of Jaypee Punjab Warriors skipper Mark Knowles foot in the 18th minute that won the visitors a PC. However, German drag flicker Christopher Ruhr was slightly off the mark as he sent the ball far and wide. 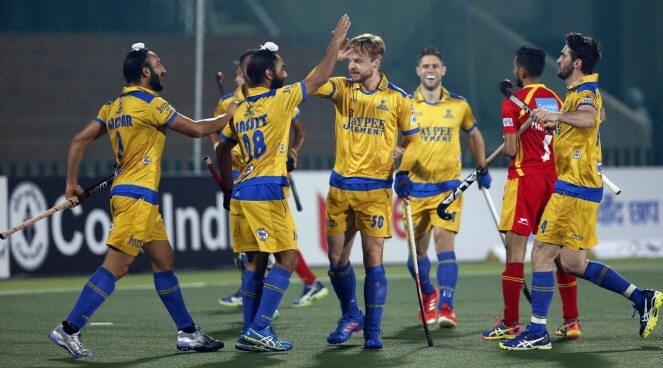 However, Mink van der Weerden didn’t dent his team’s hopes when Jaypee Punjab Warriors won a PC in the 25th minute, thanks to youngster Ajit Kumar Pandey’s clever play in the circle. Weerden, who has been in top form especially with converting PCs, gave the home crowd a reason to celebrate when he fiercely flicked the ball past the Ranchi Rays keeper Tristan Clemons. This was the Dutchman’s fourth successful attempt at converting a PC this season. The Jaypee Punjab Warriors ended the first half with a 1-0 lead. Tristan Clemons, starred in the third quarter for Jaypee Punjab Warriors as the goalkeeper saving two back-to-back PCs that seemed right on target by Ashley Jackson. This was his sixth save in the game. His efforts ensured the home team continued to enjoy the 1-0 lead. Meanwhile, the Ranchi Rays coach Harendra Singh would not be a happy man with his team’s poor PC conversion rate. The final quarter was tense with Ranchi Rays open to taking risks, making desperate attempts to fetch that elusive goal. The pressure, however, led them to make a foot foul in the circle gifting the home team another PC. There was no way Mink van der Weerden would have missed this opportunity. Though he sent the ball into the net, Ranchi Rays’ Ashley Jackson’s video referral asking if Baljit Singh who had trapped the ball stopped it with his hand was upheld by the umpires. A rookie mistake denied the Jaypee Punjab Warriors a 2-0 lead. The young Baljit Singh, didn’t seem like he was having a great day, as he found himself making a foot foul in the circle, in the 52nd minute, that handed the visitors a chance to draw level in the match through a PC. However, a different variation by Christopher Ruhr saw the ball deflect off the post. The action didn’t end there. There were as many as four PCs won by the visitors in the dying minutes of the match. But Tristan Clemons continued to be rock solid at the post denying any chance for a late comeback by the Ranchi Rays and further ensured his team walked away with the winner’s points. Mink van der Weerden of Jaypee Punjab Warriors was awarded with a prize money of Rs 50,000 for scoring the Coal India Goal of the Match from Mr B.K. Upadhyay, Regional Sales Manager, Coal India Ltd.
Manpreet Singh of Ranchi Rays won the prize of Rs 25,000 for being the Hero Young Achiever of the Match from Mr. Balbir Singh Senior, Olympian. The Airtel Most Entertaining Player of the Match was awarded to Flynn Ogilvie of Ranchi Rays that came with a prize money of Rs 25,000 and presented by Dr. Mahender Singh, Joint Director Sports, Chandigarh Administration. Tristan Clemons of Jaypee Punjab Warriors was declared the Man of the Match and was awarded a prize money of Rs 50,000 by Mr. Inderjit Vinayak, Senior Vice President, Jaypee Cement. 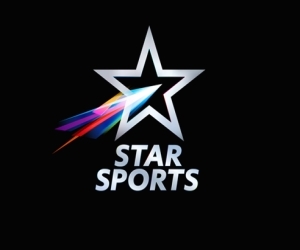 On 10 February, Uttar Pradesh Wizards will take on Kalinga Lancers in Lucknow at 1900hrs.